Need some help? Then you've come to the right place. Q. What are the solutions to scratching problems? What are they? A.One is training, which is primarily for kittens. When somebody brings us a kitten, that’s one of the things we talk about - how to train them to use a scratching post. It’s very effective. But it’s much less successful with adult cats. There are also those vinyl nail caps for cats (aka soft claws). They can be used successfully. The caps are put on with surgical adhesive and the cats usually get used to them within a day or two. They last about a month. They’re especially good for cats that need to be kept indoors for a short period of time. But it can be done long-term if done properly. Trimming nails, if you do it weekly, can help if the problem is scratching people, but it won’t stop a cat from damaging furniture. Q. Are there good reasons to declaw a cat? A.There are a couple of good reasons. Medically, sometimes you have to remove a claw if the claw is damaged beyond repair or if it has a tumour. Sometimes it’s also trauma to the owners. There are people whose immune systems are suppressed or the elderly on blood thinners who can’t be exposed to the bacteria on a cat’s claws. But the majority of declawing’s are due to social issues -- where cats are being destructive and tearing up furniture. Q. How do I keep my kitten from becoming a finicky eater? A.Pick a good feeding site. And particularly in a kitten, feed it a variety of flavors and forms of food. Always offer the different foods in separate containers. Your kitten can’t tell you what he likes and dislikes. So keep offering him choices so you can find what he’ll like and what he doesn’t. It’s like kids. You want to expose them to lots of different choices. Q. How long can my cat go without eating before I should worry? A.Not eating is not normal for cats. If a cat isn’t eating but otherwise seems healthy, then it probably doesn’t like the food. So, I’d change the food. But if it’s not eating and seems lethargic or sick, then take it to your veterinarian immediately. Q. Why does my cat like something one day and then won’t eat it the next? A.In nature, cats are very open to trying new foods. So if a cat is finicky, something is preventing its natural feeding behaviours. Then it’s a matter of figuring out what that is. It can be any number of things from it just doesn’t like the food to it’s too frightened to eat. Sometimes, just breaking a cat’s routine can put a cat off its food. This is especially true with indoor cats. They often perceive change as a threat. Q. What is the proper way to store WHISKAS® Cat Food? A.We recommend storing dry, or unopened wet WHISKAS® Cat Food products in a cool dry place, not subject to extreme hot or cold temperatures. Our dry products should not be stored in areas of humidity (washer, dryer, refrigerator, etc.) or near odorous materials (detergent, fertilizer, etc.). If possible, store our dry products in a plastic container (keep the product in the bag with top folded closed for best storage). Q. Does WHISKAS® Wet Cat Food need to be refrigerated after opening? A.Yes. Any unused portion needs to be refrigerated in a sealed container. We recommend using the food within four days of opening. You may allow the food to sit at room temperature for up to thirty minutes or microwave the food for a few seconds (in a microwave-safe dish - not in the can!) prior to feeding, as some cats do not care for cold food. Q. How can I tell if my wet or dry products are getting past shelf life? A.Shelf life studies are conducted on our products to determine optimum quality over time. If you have a concern about he freshness of your product, please note the Batch number of the product. Q. Does WHISKAS® support suppliers that use slave labour? A.We do not tolerate forced labour in any aspect of our supply chain and we are extremely concerned about allegations of abuses taking place in the Thai fishing industry. We believe that as a global business we have a responsibility to contribute to the change that the Thai fishing industry needs to make to become a reliable and sustainable supply chain. As such, it is vital that we engage with, rather than abandon the industry, to improve conditions and to stamp out any human rights abuses. We do not believe that targeting one supplier is driving the change needed in the region. We are working with a reputable third party organisation to establish transparency and visibility across all the tiers of our supply chain within Thailand. The findings are due to be ready in July, after which we will be in position to publically publish a specific and detailed plan. Q. Where does WHISKAS® stand on sustainable sourcing of fish? Q. 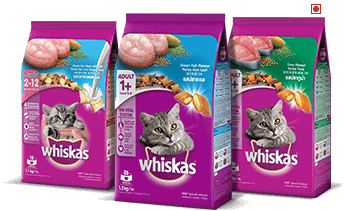 Can my kitten eat WHISKAS® Dry Adult Food? A.No. Our WHISKAS® Adult Dry Cat Food has been formulated to meet the nutritional levels established by the AAFCO Cat Food Nutrient Profiles for adult cat maintenance only. We have a kitten formula in our dry line (WHISKAS® Kitten with Chicken) that delivers great taste and that is specially formulated to meet the nutritional levels established by the AAFCO Cat Food Nutrient Profiles for All Life Stages. Q. Can WHISKAS® Milk Plus be used as a replacement for mother’s milk? A.No. WHISKAS® Milk Plus is intended for intermittent or supplemental feeding only as it does not meet the AAFCO Cat Food Nutrient Profiles for All Life Stages or adult cat maintenance. We recommend feeding your weaned kitten a mixture of WHISKAS® Kitten (with Chicken) Dry Food and WHISKAS® Wet Food. Q. How much wet food to dry food should I feed my cat? A.Always note the weight of your cat and follow the feeding guideline printed on WHISKAS® Products. Q. How many calories are in WHISKAS® Cat Food? A.It depends on the size and variety of the product. 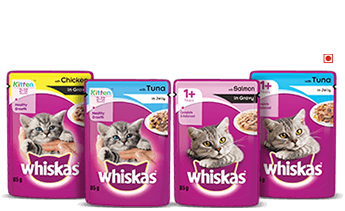 Please refer to the calorie statement which appears under the guaranteed analysis on product packages, or the Our Products section of whiskas.com.au to find out the calorie content for your specific product. Q. My dog likes your WHISKAS® Cat Food — is it ok for him to eat it, too? A.No. Dogs and cats have different nutritional requirements and should be fed food that is formulated for them. However, if your dog accidently eats WHISKAS® Cat Food, your dog should be fine if he is not on any special/restricted diet. Q. How do I transition from my previous food to your food? A.Gradually introduce the new WHISKAS® Dry Food over a 7 day period to avoid digestive upsets. Reduce the current food and increase WHISKAS® Dry until you are feeding it exclusively. Q. My cat doesn’t chew your kibble, she just swallows it. Is that okay? A.Cats’ teeth are different from humans. They are designed for biting and tearing, so they are not efficient at chewing food. Depending on the size of dry kibble that they are eating, they may bite only once or twice before swallowing. If your cat is new to the diet, we recommend transitional feeding. As long as your cat does not vomit or exhibit other signs of digestive upset, then this should not be a concern. Nutritionally complete and balanced, our kitten and adult meals are tasty and full of the natural goodness your pet needs to lead a healthy and active life.